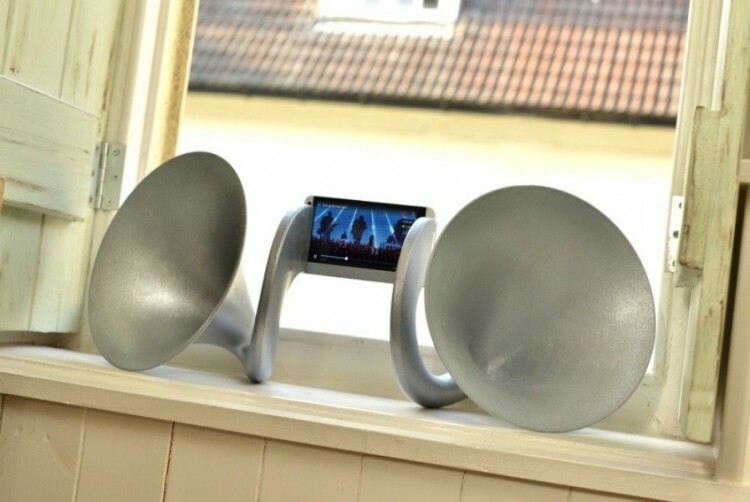 If you happen to have £999 (~$1,600) to spend on something crazy, consider picking up this new, electronics-free amplifying horn for your HTC One. That's right: for $1,600, you can buy two massive trumpets, connected to a dock, that sit up against the One's stereo front-facing speakers and amplify the sound by 50%. The horn arrangement is the first part of HTC's "Here's to Creativity" campaign that's designed to support young artists in the United Kingdom. Justin Wolter was commissioned by HTC to create this device, known as the Gramohorn II, with the $1,600 unit being made from plaster resin and constructed via 3D printing. Oh, and if you don't particularly fancy the plaster model, there's also a limited edition stainless steel model, which will set you back a whopping £4,999 (~$8,000). Combine that with the £1,579 (~$2,500) 24 carat gold HTC One, and you've got yourself a ridiculously expensive HTC-powered sound setup. As resonance amplification isn't exactly the best method for improving sound quality, especially from a smartphone's speakers, it may be worth spending your cash on a proper sound setup. But hey, that trumpet will be the talking point of any room you decide to chuck it in.